In our quest to understand sustainability we have rushed to comprehend such factors as energy transformations, biophysical constraints, and environmental deterioration, as well as the human characteristics that drive production and consumption, and the assumptions of neoclassical economics. As our knowledge of these matters increases, practical applications of ecological economics are emerging. Yet amidst these advances something important is missing. Any human problem is but a moment of reaction to prior events and processes. Historical patterns develop over generations or even centuries. Rarely will the experience of a lifetime disclose fully the origin of an event or a process. Employment levels in natural resource production, for example, may respond to a capital investment cycle with a lag time of several decades (Watt 1992). The factors that cause societies to collapse take centuries to develop (Tainter 1988). To design policies for today and the future we need to understand social and economic processes at all temporal scales, and comprehend where we are in historical patterns. Historical knowledge is essential to sustainability (Tainter 1995a). No program to enhance sustainability can be considered practical if it does not incorporate such fundamental knowledge. In this era of global environmental change we face what may be humanity’s greatest crisis. The cluster of transformations labeled global change dwarfs all previous experiences in its speed. in the geographical scale of its consequences, and in the numbers of people who will be affected (Norgaard 1994). Yet many times past human populations faced extraordinary challenges, and the difference between their problems and ours is only one of degree. One might expect that in a rational, problem-solving society, we would eagerly seek to understand historical experiences. In actuality, our approaches to education and our impatience for innovation have made us averse to historical knowledge (Tainter 1995a). In ignorance, policy makers tend to look for the causes of events only in the recent past (Watt 1992). As a result, while we have a greater opportunity than the people of any previous era to understand the long-term reasons for our problems, that opportunity is largely ignored. Not only do we not know where we are in history, most of our citizens and policy makers are not aware that we ought to. A recurring constraint faced by previous societies has been complexity in problem solving. It is a constraint that is usually unrecognized in contemporary economic analyses. For the past 12,000 years human societies have seemed almost inexorably to grow more complex. For the most part this has been successful: complexity confers advantages, and one of the reasons for our success as a species has been our ability to increase rapidly the complexity of our behavior (Tainter 1992, 1995b). Yet complexity can also be detrimental to sustainability. Since our approach to resolving our problems has been to develop the most complex society and economy of human history, it is important to understand how previous societies fared when they pursued analogous strategies. In this chapter I will discuss the factors that caused previous societies to collapse, the economics of complexity in problem solving, and some implications of historical patterns for our efforts at problem solving today. This discussion indicates that part of our response to global change must be to understand the long-term evolution of problem-solving systems. As a simple illustration of differences in complexity, Julian Steward pointed out the contrast between the native peoples of western North America, among whom early ethnographers documented 3,000 to 6,000 cultural elements, and the U.S. Army, which landed 500,000+ artifact types at Casablanca in World War 11 (Steward 1955). Complexity is quantifiable. For over 99% of the history of humanity we lived as low-density foragers or farmers in egalitarian communities of no more than a few dozen persons (Carneiro 1978). Leslie White pointed out that such a cultural system, based primarily on human labor, can generate only about 1/20 horsepower per capita per year (White 1949, 1959). From this base of undifferentiated societies requiring small amounts of energy, the development of complex cultural systems was, a priori, unlikely. The conventional view has been that human societies have a latent tendency towards greater complexity. Complexity was assumed to be a desirable thing, and the logical result of surplus food, leisure time, and human creativity. Although this scenario is popular, it is inadequate to explain the evolution of complexity. In the world of cultural complexity there is, to use a colloquial expression, no free lunch. More complex societies are costlier to maintain than simpler ones and require higher support levels per capita. A society that is more complex has more sub-groups and social roles, more networks among groups and individuals, more horizontal and vertical controls, higher flow of information, greater centralization of information, more specialization, and greater interdependence of parts. Increasing any of these dimensions requires biological, mechanical, or chemical energy. In the days before fossil fuel subsidies, increasing the complexity of a society usually meant that the majority of its population had to work harder (Tainter 1988, 1992, 1994a, 1995a, 1995b). Many aspects of human behavior appear to be complexity averse (Tainter 1995b). The so-called “complexity of modern life” is a regular complaint in popular discourse. Some of the public discontent with government stems from the fact that government adds complexity to people’s lives. In science, the Principle of Occam’s Razor has enduring appeal because it states that simplicity in explanation is preferable to complexity. Research and development (Price 1963; Rescher 1978, 1980; Rostow 1980; Tainter 1988, 1995a). In each of these areas, complexity increases through greater differentiation, specialization, and integration. The development of complexity is thus an economic process: complexity levies costs and yields benefits. It is an investment, and it gives a variable return. Complexity can be both beneficial and detrimental. Its destructive potential is evident in historical cases where increased expenditures on socioeconomic complexity reached diminishing returns, and ultimately, in some instances, negative returns (Tainter 1988, 1994b). This outcome emerges from the normal economic process: simple, inexpensive solutions are adopted before more complex, expensive ones. Thus, as human populations have increased, hunting and gathering has given way to increasingly intensive agriculture, and to industrialized food production that consumes more energy than it produces (Clark and Haswell 1966; Cohen 1977; Hall et al. 1992). Minerals and energy production move consistently from easily accessible, inexpensively exploited reserves to ones that are costlier to find, extract, process, and distribute. Socioeconomic organization has evolved from egalitarian reciprocity, short-term leadership, and generalized roles to complex hierarchies with increasing specialization. Figure 4.1. Deminishing returns to increasing complexity (after Tainter 1988). Two things make a society liable to collapse at this point. First new emergencies impinge on a people who are investing in a strategy that yields less and less marginal return. As such a society becomes economically weakened it has fewer reserves with which to counter major adversities. A crisis that the society might have survived in its earlier days now becomes insurmountable. As such a society evolves along the marginal return curve beyond B2, C2, it crosses a continuum of points, such as B1, C3, where costs are increasing, but the benefits have actually declined to those previously available at a lower level of complexity. This is a realm of negative returns to investment in complexity. A society at such a point would find that, upon collapsing, its return on investment in complexity would noticeably rise. A society in this condition is extremely vulnerable to collapse. This argument, developed and tested to explain why societies collapse (Tainter 1988), is also an account of historical trends in the economics of problem solving. The history of cultural complexity is the history of human problem solving. In many sectors of investment, such as resource production, technology, competition, political organization, and research, complexity is increased by a continual need to solve problems. As easier solutions are exhausted, problem solving moves inexorably to greater complexity, higher costs, and diminishing returns. This need not lead to collapse, but it is important to understand the conditions under which it might. To illustrate these conditions it is useful to review three examples of increasing complexity and costliness in problem solving: the collapse of the Roman Empire, the development of industrialism, and trends in contemporary science. One outcome of diminishing returns to complexity is illustrated by the collapse of the Western Roman Empire. As a solar-energy based society which taxed heavily, the empire had little fiscal reserve. When confronted with military crises, Roman Emperors often had to respond by debasing the silver currency (Figure 4.2) and trying to raise new funds. In the third century A.D. constant crises forced the emperors to double the size of the army and increase both the size and complexity of the government. To pay for this, masses of worthless coins were produced, supplies were commandeered from peasants, and the level of taxation was made even more oppressive (up to two-thirds of the net yield after payment of rent). Inflation devastated the economy. Lands and population were surveyed across the empire and assessed for taxes. Communities were held corporately liable for any unpaid amounts. While peasants went hungry or sold their children into slavery, massive fortifications were built, the size of the bureaucracy doubled, provincial administration was made more complex, large subsidies in gold were paid to Germanic tribes, and new imperial cities and courts were established. With rising taxes, marginal lands were abandoned and population declined. Peasants could no longer support large families. To avoid oppressive civic obligations, the wealthy fled from cities to establish self-sufficient rural estates. Ultimately, to escape taxation, peasants voluntarily entered into feudal relationships with these land holders. A few wealthy families came to own much of the land in the western empire, and were able to defy the imperial government. The empire came to sustain itself by consuming its capital resources; producing lands and peasant population (Jones 1964, 1974; Wickham 1984; Tainter 1988, 1994b). The Roman Empire provides history’s best-documented example of how increasing complexity to resolve problems leads to higher costs, diminishing returns, alienation of a support population, economic weakness, and collapse. In the end it could no longer afford to solve the problems of its own existence. Figure 4.2. Debasement of the Roman silver currency, 0-269 A.D. (after Tainter 1994b with modifications). The chart shows grams of silver per denarius (the basic silver coin) from 0 to 237 A.D., and per 1/2 denarius from 238-269 A.D. (when the denarius was replaced by a larger coin tariffed at two denarii). The fate of the Roman Empire is not the unavoidable destiny of complex societies. It is useful to discuss a historical case that turned out quite differently. In one of the most interesting works of economic history, Richard Wilkinson (1973) showed that in late-and post-medieval England, population growth and deforestation stimulated economic development, and were at least partly responsible for the Industrial Revolution. Major increases in population, at around 1300, 1600, and in the late 18th century, led to intensification in agriculture and industry. As forests were cut to provide agricultural land and fuel for a growing population, England’s heating, cooking, and manufacturing needs could no longer be met by burning wood. Coal came to be increasingly important, although it was adopted reluctantly. Coal was costlier to obtain and distribute than wood, and restricted in its occurrence. It required a new, costly distribution system. As coal gained importance in the economy the most accessible deposits were depleted. Mines had to be sunk ever deeper, until groundwater came to be a problem. Ultimately, the steam engine was developed and put to use pumping water from mines. With the development of a coal-based economy, a distribution system, and the steam engine, several of the most important technical elements of the Industrial Revolution were in place. Industrialism, that great generator of economic well-being, came in part from steps to counteract the consequences of resource depletion, supposedly a generator of poverty and collapse. Yet it was a system of increasing complexity that did not take long to show diminishing returns in some sectors. This point will be raised again later. Contemporary science is humanity’s greatest exercise in problem solving. Science is an institutional aspect of society, and research is an activity that we like to think has a high return. Yet as generalized knowledge is established early in the history of a discipline, the work that remains to be done is increasingly specialized. These types of problems tend to be increasingly costly and difficult to resolve, and on average advance knowledge only by small increments (Rescher 1978, 1980; Tainter 1988). Increasing investments in research yield declining marginal returns. Some notable scholars have commented upon this. Walter Rostow once argued that marginal productivity first rises and then declines in individual fields (1980). The great physicist Max Planck, in a statement that Nicholas Rescher calls “Plancks Principle of Increasing Effort”, observed that “…with every advance [in science] the difficulty of the task is increased” (Rescher 1980). As easier questions are resolved, science moves inevitably to more complex research areas and to larger, costlier organizations (Rescher 1980). Rescher suggests that “As science progresses within any of its specialized branches, there is a marked increase in the overall resource-cost to realizing scientific findings of a given level [of] intrinsic significance…” (1978). Exponential growth in the size and costliness of science is necessary simply to maintain a constant rate of progress (Rescher 1980). Derek de Solla Price noted that in 1963 science was, even then, growing faster than either the population or the economy, and of all scientists who had ever lived, 80-90% were still alive at the time of his writing (Price 1963). In the same period, such matters prompted Dael Wolfle to publish a query in Science titled “How Much Research for a Dollar?” (Wolfle 1960). Scientists rarely think about the benefit/cost ratio to investment in their research. Yet if we assess the productivity of our investment in science by some measure such as the issuance of patents (Figure 4.3), the productivity of certain kinds of research appears to be declining. Patenting is a controversial indicator among those who study such matters (Machlup 1962; Schmookler 1966; Griliches 1984), and does not by itself indicate the economic return to the expenditures. Medicine is a field of applied science where the return to investment can be determined more readily. 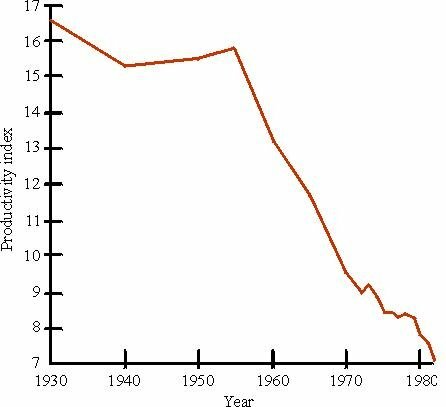 Over the 52-year period shown in Figure 4.4, from 1930-1982, the productivity of the United States health care system for improving life expectancy declined by nearly 60%. The declining productivity of the United States health care system illustrates clearly the historical development of a problem-solving field. Rescher (1980) points out: Once all of the findings at a given state-of-the-art level of investigative technology have been realized, one must move to a more expensive level…. In natural science we are involved in a technological arms race: with every victory over nature the difficulty of achieving the breakthroughs which lie ahead is increased. The declining productivity of medicine is due to the fact that the inexpensive diseases and ailments were conquered first (the basic research that led to penicillin costing no more than $20,000), so that those remaining are more difficult and costly to resolve (Rescher 1978). And as each increasingly expensive disease is conquered, the increment to average life expectancy becomes ever smaller. Figure 4.4. Productivity of the U.S. health care system, 1930-1982 (data from Worthington 1975; U.S. Bureau of Census 1983). Productivity index = (Life expentancy)/(National health expenditures as percent of GNP). The Roman Empire, industrialism, and science are important, not only for their own merits, but also because they exemplify: (1) how problem solving evolves along a path of increasing complexity, higher costs, and declining marginal returns (Tainter 1988), and (2) some different outcomes of that process. In the next section, I discuss what these patterns imply for our efforts to address contemporary problems. This historical discussion gives a perspective on what it means to be practical and sustainable. A few years ago I described about two dozen societies that have collapsed (Tainter 1988). In no case is it evident or even likely that any of these societies collapsed because its members or leaders did not take practical steps to resolve its problems (Tainter 1988). The experience of the Roman Empire is again instructive. Most actions that the Roman government took in response to crises-such as debasing the currency, raising taxes, expanding the army, and conscripting labor-were practical solutions to immediate problems. It would have been unthinkable not to adopt such measures. Cumulatively, however, these practical steps made the empire ever weaker, as the capital stock (agricultural land and peasants) was depleted through taxation and conscription. Over time, devising practical solutions drove the Roman Empire into diminishing, then negative, returns to complexity. The implication is that to focus a problem-solving system, such as ecological economics, on practical applications will not automatically increase its value to society, nor enhance sustainability. The historical development of problem-solving systems needs to be understood and taken into consideration. Most who study contemporary issues certainly would agree that solving environmental and economic problems requires both knowledge and education. A major part of our response to current problems has been to increase our level of research into environmental matters, including global change. As our knowledge increases and practical solutions emerge, governments will implement solutions and bureaucracies will enforce them. New technologies will be developed. Each of these steps will appear to be a practical solution to a specific problem. Yet cumulatively these practical steps are likely to bring increased complexity, higher costs, and diminishing returns to problem solving. Richard Norgaard has stated the problem well: “Assuring sustainability by extending the modem agenda… will require, by several orders of magnitude, more data collection, interpretation, planning, political decision-making, and bureaucratic control” (Norgaard 1994). Donella Meadows and her colleagues have given excellent examples of the economic constraints of contemporary problem solving. To raise world food production from 1951-1966 by 34%, for example, required increasing expenditures on tractors of 63%, on nitrate fertilizers of 146%, and on pesticides of 300%. To remove all organic wastes from a sugar-processing plant costs 100 times more than removing 30%. To reduce sulfur dioxide in the air of a U.S. city by 9.6 times, or particulates by 3.1 times, raises the cost of pollution control by 520 times (Meadows et al. 1972). All environmental problem solving will face constraints of this kind. Bureaucratic regulation itself generates further complexity and costs. As regulations are issued and taxes established, those who are regulated or taxed seek loopholes and lawmakers strive to close these. A competitive spiral of loophole discovery and closure unfolds, with complexity continuously increasing (Olson 1982). In these days when the cost of government lacks political support, such a strategy is unsustainable. It is often suggested that environmentally benign behavior should be elicited through taxation incentives rather than through regulations. While this approach has some advantages, it does not address the problem of complexity, and may not reduce overall regulatory costs as much as is thought. Those costs may only be shifted to the taxation authorities, and to the society as a whole. It is not that research, education, regulation, and new technologies cannot potentially alleviate our problems. With enough investment perhaps they can. The difficulty is that these investments will be costly, and may require an increasing share of each nation’s gross domestic product. With diminishing returns to problem solving, addressing environmental issues in our conventional way means that more resources will have to be allocated to science, engineering, and government. In the absence of high economic growth this would require at least a temporary decline in the standard of living, as people would have comparatively less to spend on food, housing, clothing, medical care, transportation, and entertainment. To circumvent costliness in problem solving it is often suggested that we use resources more intelligently and efficiently. Timothy Allen and Thomas Hoekstra, for example, have suggested that in managing ecosystems for sustainability, managers should identify what is missing from natural regulatory process and provide only that. The ecosystem will do the rest. Let the ecosystem (i.e., solar energy) subsidize the management effort rather than the other way around (Allen and Hoekstra 1992). It is an intelligent suggestion. At the same time, to implement it would require much knowledge that we do not now possess. That means we need research that is complex and costly, and requires fossil-fuel subsidies. Lowering the costs of complexity in one sphere causes them to rise in another. Agricultural pest control illustrates this dilemma. As the spraying of pesticides exacted higher costs and yielded fewer benefits, integrated pest management was developed. This system relies on biological knowledge to reduce the need for chemicals, and employs monitoring of pest populations, use of biological controls, judicious application of chemicals, and careful selection of crop types and planting dates (Norgaard 1994). It is an approach that requires both esoteric research by scientists and careful monitoring by farmers. Integrated pest management violates the principle of complexity aversion, which may partly explain why it is not more widely used. Such issues help to clarify what constitutes a sustainable society. The fact that problem-solving systems seem to evolve to greater complexity, higher costs, and diminishing returns has significant implications for sustainability. In time, systems that develop in this way are either cut off from further finances, fail to solve problems, collapse, or come to require large energy subsidies. This has been the pattern historically in such cases as the Roman Empire, the Lowland Classic Maya, Chacoan Society of the American Southwest, warfare in Medieval and Renaissance Europe, and some aspects of contemporary problem solving (that is, in every case that I have investigated in detail) (Tainter 1988, 1992, 1994b, 1995a). These historical patterns suggest that one of the characteristics of a sustainable society will be that it has a sustainable system of problem solving-one with increasing or stable returns, or diminishing returns that can be financed with energy subsidies of assured supply, cost, and quality. Industrialism illustrates this point. It generated its own problems of complexity and costliness. These included railways and canals to distribute coal and manufactured goods, the development of an economy increasingly based on money and wages, and the development of new technologies. While such elements of complexity are usually thought to facilitate economic growth, in fact they can do so only when subsidized by energy. Some of the new technologies, such as the steam engine, showed diminishing returns to innovation quite early in their development (Wilkinson 1973; Giarini and Louberge 1978; Giarini 1984). What set industrialism apart from all of the previous history of our species was its reliance on abundant, concentrated, high-quality energy (Hall et al. 1992). 5 With subsidies of inexpensive fossil fuels, for a long time many consequences of industrialism effectively did not matter. Industrial societies could afford them. When energy costs are met easily and painlessly, benefit/cost ratio to social investments can be substantially ignored (as it has been in contemporary industrial agriculture). Fossil fuels made industrialism, and all that flowed from it (such as science, transportation, medicine, employment, consumerism, high-technology war, and contemporary political organization), a system of problem solving that was sustainable for several generations. Energy has always been the basis of cultural complexity and it always will be. If our efforts to understand and resolve such matters as global change involve increasing political, technological, economic, and scientific complexity, as it seems they will, then the availability of energy per capita will be a constraining factor. To increase complexity on the basis of static or declining energy supplies would require lowering the standard of living throughout the world. In the absence of a clear crisis very few people would support this. To maintain political support for our current and future investments in complexity thus requires an increase in the effective per capita supply of energy-either by increasing the physical availability of energy, or by technical, political, or economic innovations that lower the energy cost of our standard of living. Of course, to discover such innovations requires energy, which underscores the constraints in the energy-complexity relation. The more likely option is a future of greater investments in problem solving, increasing overall complexity, and greater use of energy. This option is driven by the material comforts it provides, by vested interests, by lack of alternatives, and by our conviction that it is good. If the trajectory of problem solving that humanity has followed for much of the last 12,000 years should continue, it is the path that we are likely to take in the near future. Regardless of when our efforts to understand and resolve contemporary problems reach diminishing returns, one point should be clear. It is essential to know where we are in history (Tainter 1995a). If macroeconomic patterns develop over periods of generations or centuries, it is not possible to comprehend our current conditions unless we understand where we are in this process. We have the the opportunity to become the first people in history to understand how a society’s problem-solving abilities change. To know that this is possible yet not to act upon it would be a great failure of the practical application of ecological economics. This chapter is revised from a plenary address to the Third International Meeting of the International Society for Ecological Economics, San Jose, Costa Rica, 28 October 1994. I am grateful to Cutler J. Cleveland, Robert Costanza, and Olman Segura for the invitation to present the address, to Maureen Garita Matamoros for assistance during the conference, to Denver Burns, John Faux, Charles A. S. Hall, Thomas Hoekstra, Joe Kerkvliet, and Daniel Underwood for comments on the plenary address, and to Richard Periman and Carol Raish for reviewing this version. In some literature of the physical sciences, striving for a definition as objective as possible, the complexity of a system is considered to be the length of a description of its regularities (Gell-Mann 1992, 1994). This is compatible with the definition employed here. A society with fewer parts, less differentiated parts, and fewer or simpler integrative systems can certainly be described more succinctly than can a society with more of these (Tainter 1995b). Collapse is a rapid transformation to a lower degree of complexity, typically involving significantly less energy consumption (Tainter 1988). This is part of the process responsible for contemporary separatist movements in the U.S. I have not considered so-called “green” alternatives in this analysis. There are two reasons why these appear to be impractical in the short-term. Firstly, industrial economies are closely coupled to the existing production system and resource base, including conventional energy (Hall et al. 1992; Watt 1992). The capital costs of massive, rapid industrial conversion would be very high. Secondly, experience since 1973 indicates that most members of industrial societies will not change their consumption patterns merely because of abstract projections about the long-term supply of energy or other resources. They will do so only when the prices of energy, and of goods and services that rely on energy, rise sharply for an extended time. It takes protracted hardship to convince people that the world to which they have been accustomed has changed irrevocably. Hardship that is minor or episodic merely allows leaders to exploit popular discontent for personal gain. Economic growth has become mythologized as part of our ideology, which makes it particularly difficult to discuss objectively in the public arena (Giarini and Louberge 1978). Coal of course was not the only element that promoted industrialism. Other factors included declining supplies of fuelwood (Wilkinson 1973), changes in land-use laws. and availability of laborers who could be employed in manufacturing. Tainter, Joseph A. 1994b. La fine dell’amministrazione centrale: il collasso dell’Impero romano in Occidente. In Storia d’Europa, Volume Secondo: Preistoria e Antichita, eds. Jean Guilaine and Salvatore Settis, pp. 1207-1255. Turin: Einaudi. Wolfle, D. 1960. How much research for a dollar? Science 132: 517.